I’ve always liked Ozeri products. I was given the chance to review a Brezza Oscalating Fan and their Precision II Bathroom Scale 2 yrs ago. Now we have had the opportunity to review the Ozeri Green Earth Textured Nonstick Skillet. Let me just say, we LOVE this pan! We recently had the opportunity to review one of the best frying pans we have ever used! 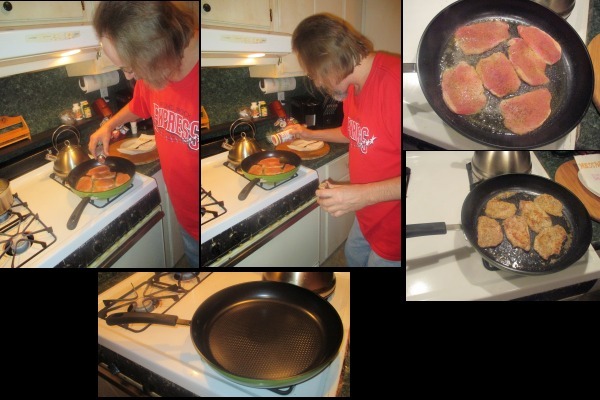 My husband used the Ozeri Green Earth Skillet to fry up some pork chops and he said it’s the best frying pan ever! We love the fact that it is 100% PTFE and PFOA Free. The textured surface is awesome! It makes the pan so unbelievably easy to clean! I just ran HOT water and wiped it clean! No soap needed! Last thing I want to do after eating is to scrub a pan! The Ozeri Green Earth pan also comes with a full warranty in case you have any issues. The pan is also very good at keeping in the moisture so your meals don’t come out dry! I can’t say enough great things about the Ozeri skillet. 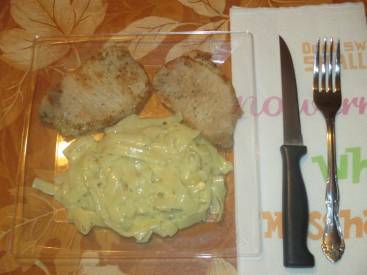 Look at how yummy these pork chops look, this pan cooked it to perfection! Visit amazon today to purchase the 12″ Ozeri Green Earth Textured Ceramic Nonstick Frying Pan! 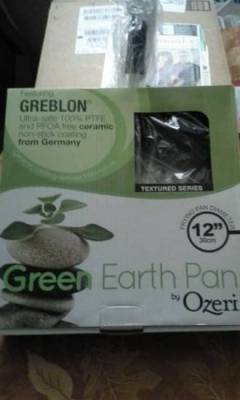 Unlike other ceramic cookware brands, each Ozeri Green Earth pan utilizes GREBLON ceramic – an ultra-safe ceramic coating from Germany which is 100% PTFE and PFOA free (no heavy metals or chemicals). Utilizing GREBLON — a natural ceramic coating from Germany, the Green Earth Pan by Ozeri is one of the world’s first frying pans to achieve non-stick perfection while remaining absolutely free of PTFE, PFOA and other harmful chemicals. Conventional non-stick cookware is achieved through a coating of PTFE (PolyTetraFluoroEthylene), a synthetic substance that has waxy properties. At very high temperatures, PTFE begins to decompose and release fumes which are documented to be lethal to birds and small pets, and which can be harmful to humans. In addition, traditional pans incorporating PTFE are manufactured with the aid of PFOA (PerFluoroOctanoic Acid), which the EPA has classified as a ‘persistent pollutant of the environment’. With the Green Earth Pan’s GREBLON ceramic from Germany, even under high temperatures, no harmful toxic fumes are ever released into the environment. This is because the Green Earth Pan utilizes a 100% ceramic coating derived from nature – not from a laboratory. The Green Earth Pan’s ceramic coating is completely free of PTFE and PFOA. The Green Earth Pan’s natural ceramic coating is also far more durable and scratch-resistant than other non-stick surfaces. With better non-stick properties, the Green Earth Pan allows you to cook with as little as half the amount of oil normally used, and it makes cleaning a breeze. The Green Earth Pan by Ozeri is made of the highest quality anodized aluminum that allows for even cooking and fantastic browning without the risk of hot spots. It boasts a magnetized bottom for rapid heat transfer on induction stoves, and a heat resistant silicone coated handle. This version of the Green Earth Pan features a textured ceramic cooking surface. The elevations of the textured cooking surface create air pockets which distribute heat underneath food to enhance cooking performance. Your satisfaction is guaranteed. GREBLON ceramic made by Weilburger GmbH, Germany. Final assembly in China.